Monrovia, Liberia - Barely three days after reaching out to dozens of fire victims in the Popo Beach community in New Kru Town where he provided some emergency supplies and promised to rebuild their homes, President George Weah has promised to relocate another group of fire victims. On Wednesday, April 10, 2019 fire gutted a 19-bedroom zinc house on Smythe Road in the Old Road Community, leaving dozens of occupants, including women, children and the elderly homeless. 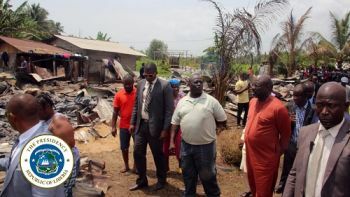 Moved by the horrifying story of the victims, President Weah on Thursday, April 11, 2019 visited the disaster scene to identify with the victims. Following a brief chat with the victims to familiarize himself with the extent of the tragedy, the Liberian leader assured the victims of his Government’s support. As he did during his visit to Popo Beach, the Liberian leader and entourage, flanked by the fire victims and other community dwellers, walked through the rubbles of the burned structure. The Liberian President expressed his deepest regrets about the fire incident and promised the 52 victims of government’s determination to relocate them. Amid applause and songs of praises rendered by the victims and well-wishers, President Weah announced that the government, especially his office, would take charge of the situation as a way of showing care, love and support for the 19 family heads and their dependents who have lost properties to the fire incident. Since the burnt house was built on an alley, the President said the victims would be given temporary shelters while the government makes frantic efforts to relocate them on the Roberts International Airport Highways. The President said his government is committed to addressing the needs of its people, especially those struck by disasters and are in dire need of humanitarian assistance. While the government wants to relocate the victims in new structures to be built later, the President said it would be up to the 19 family heads to decide their next moves. President Weah has further ordered the Ministry of State for Presidential Affairs and relevant government agencies to work with the Smythe Road community leadership to ensure that the victims have immediate temporary shelters while the government is working out modalities for permanent shelters.